We couldn’t have a collection of household and house images without a key or two. 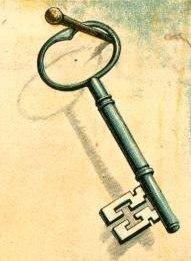 This vintage skeleton key image is the first of hopefully many more key images that we will be adding to Reusable Art. The key dangles from a nail in a wall, waiting to open something up. Perhaps you could use it to open up a composition or two.